Unique Accommodation Victoria - hot mineral springs & Spa resort offering completely private indoor and outdoor bathing for couples and small groups. 45 minutes from Melbourne in the Dandenong Ranges and Yarra Valley. Luxury couples accommodation, Victoria. one night and two night luxury romantic getaways Victoria. Japanese Mountain Retreat provides the most exclusive romantic getaways in Melbourne. Designed for couples and visitors seeking a luxury spa retreat. Bathe in hot mineral springs drawn from the surrounding mountains of the Dandenong Ranges. Come for the day and indulge in private hot spring bathing indoors or outdoors, massage, and dining. Or stay in our exclusive and unique Japanese accommodation for a romantic weekend getaway. We are the only hot mineral springs in Victoria that provide Melbourne romantic getaways exclusively for couples wanting complete privacy and pampering and are only 45 minutes from Melbourne. All day spa treatments are in the sumptuously decorated Spa De Marrakech. We also offer honeymoon style seductive packages staying in an authentic Balinese spa villa at Balinese Retreat. For a romantic getaway near Melbourne there’s nothing like the absolute seclusion of a private resort. We have a range of romantic getaway packages to create the perfect atmosphere for couples to celebrate a special anniversary or romantic occasion. For the best luxury couples accommodation in Victoria, choose from our range of Melbourne romantic getaways for one or two nights. Stay in traditional Japanese accommodation, enjoy intimate dining, and pre dinner cocktails. Luxuriate in natural mineral waters heated to 37-40 degrees, surrounded by mountains, or bathe privately indoors. We are the only spa resort in Australia offering mineral bathing in an exclusively private setting catering to couples or small groups. Pampering takes on a whole new meaning when you book one of our exclusive day spa packages. Combine bathing and a choice of massage, or choose from our selection of exotic packages and body treatments. 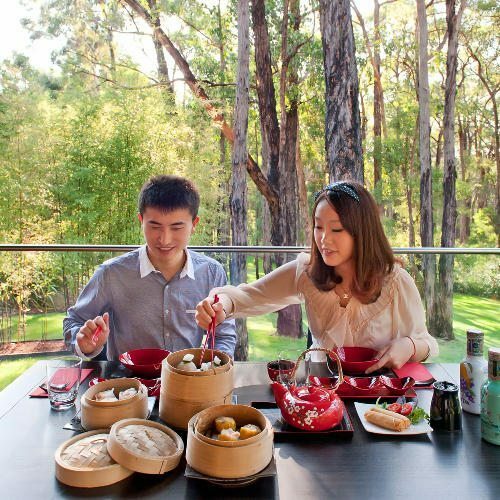 When you visit for bathing and massage, why not combine your experience with Yum Cha or cocktails at the bar and a three course dinner for two in our restaurant. Just had the most wonderful night. Relaxing. Exceptional service and surroundings. Thank you. Amazing tranquil surrounds really complete the experience loved every moment. Thank you Deborah and staff. Perfect for Winter - especially the Onsen! so private and authentic! Would love to try the Balinese villa! thank you! This place is absolutely beautiful and tranquil. The service was fantastic, all the staff greeted us with a smile and an eagerness for us to enjoy our stay. I wish I spent my whole holiday here. My partner and I give many thanks to the owner. We came for a romantic getaway weekend to celebrate our two year anniversary. Deborah and the girls were welcoming and professional. They ensured our weekend was smooth, private and charming. My expectations (which were high) were met or exceeded in every way. Thank you so much, we will see you again! What an amazing retreat! Thank you so much for spending 10 hard years putting together this amazing heaven. We will be back! What a wonderful experience for my birthday present! The service was excellent and the massage was very relaxing! Had a great morning and will definitely be back soon. On top of that, the food was delicious - we had the yum cha package. Thank you for a great experience. Best massage experience ever! Such a relaxing and quiet place. Would highly recommend to everyone! Recently, we visited with mum. Beautiful place, exceptional service, welcoming atmosphere, the owner is a super lovely lady, the nature is just amazing and of course the experience in the hot mineral springs and the Marrakesh massage followed by a lovely yum cha lunch were just amazing. We will definitely be back!! !